Buddhist weddings are a wonderful way to refresh a marriage or to begin your married life together. The highlight of the Monks Blessing and Island Tour wedding package is the blessing by 5 monks at Phuket’s most famous and beautiful temple, Wat Chalong. You don’t have to be Buddhist to partake in the ceremony and, in fact more and more Western couples choose to have a Buddhist ceremony when planning their Phuket wedding. As it is believed that the Buddhist weddings will bring your relationship good luck and harmony. 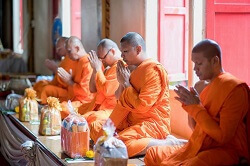 The Buddhist blessing and Island tour package includes a two or three hour Phuket Island tour. Which takes you to a collection of beautiful beaches and viewpoints in Phuket, including Phuket Town, Big Buddha and Promthep Cape. Following your Island tour you and your guests will stop at Wat Chalong Temple, where you and your loved one will be blessed by five monks. To be blessed by five Monks is prestigious in Thailand and brings good luck & fortune. After the Buddhist blessing there will be plenty of photo opportunities in the temple area. The Buddhist wedding ceremony is the perfect package for those who are married already and want to reaffirm their wedding vows to one another. Or for couples who are looking for affordable wedding ideas that's both simple and unique. The Buddhist wedding ceremony at Wat Chalong is held in the afternoon. For couples who would like a Monks Blessing but don't require a tour of the Island, this package can be modified for you. If you would like to wear traditional Thai costumes for your Monks blessing the wedding planner will be happy to help you source your outfit. For further information about the Buddhist Blessing and Island Tour Package, or prices on one of the other packages, please complete the following contact form and the wedding planner will contact you. 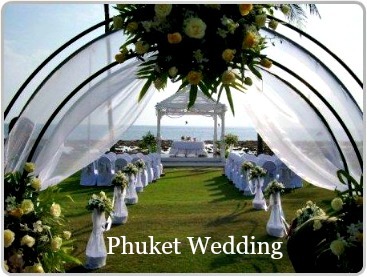 By completing this contact form your details and any questions you may have will be sent onto our preferred and most trusted wedding planner in Phuket.